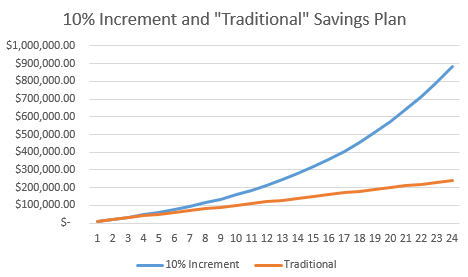 Is this incremental Saving Formula Correct? I'm planning to save some money. I earn in Pakistani Rupees. At the time of posting 1Usd = Rs 123.12. 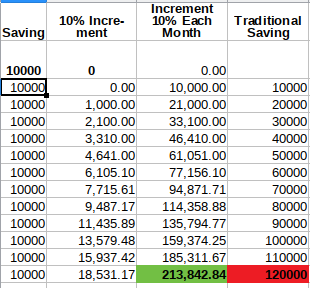 I came up with an idea to save a certain amount each month and add additional 10% of the saved amount. If you could earn 10% monthly interest on your savings, then this calculation might make sense. Assuming you almost certainly can't, you are proposing a plan in which the amount you save each month increases very rapidly. Why do you think you will be able to afford to contribute more than Rs 28,000 per month by a year from now, if you can't currently? That money has to come from somewhere. Yes, your math is correct. These two options basically show exponential and linear growth respectively. A 10% increase in deposits each month is very, very large. On month 24 you add nearly $80,000 on top of your base $10,000. And that additional amount keeps growing. Not the answer you're looking for? Browse other questions tagged savings calculation or ask your own question. What is the formula for calculating the amount of money I end up with in a given period (salary and compounding effect)? What to do with monthly income I don't immediately need?